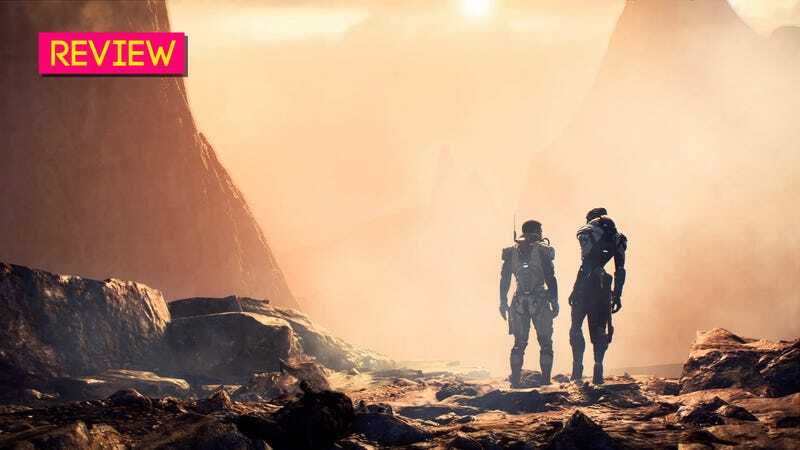 Mass Effect: Andromeda sprawls and sprawls, eagerly offering you so much to see and do that it nearly loses itself in the process. In this massive and uncertain voyage into an alien galaxy, the best way to center yourself is to hold on to other people, and trust that the mission will accomplish at least some of its ambitious goals. Within the first hour, the player is awarded the title of “Pathfinder,” that is, someone who must direct humanity to planets suitable for colonization. You will, of course, wonder if such a huge responsibility can rest on the shoulders of a mere soldier, but the question of leadership—who earns it, whether or not someone can be ready for it, and what defines an inspiring leader—is a running theme throughout Andromeda. Complicating things further is the “Additional tasks” category, which, when compared to other types, make these quests sound like busywork. Paradoxically, the flavor text of non-priority missions still promised world-building and character studies, which are crucial to making the player care about anything. When a quest asks you to collect 10 plants, it doesn’t sound worth your time, no? What about when it asks you to scan 10 pieces of salvage hailing from one of the key missing ships? That sounds like it could be important, right? Surprise, it’s not. And that quest that you thought sounded like nothing, hey, it actually has a well-written character that ties the whole place together. You never know, and that’s part of the problem. The mere act of finding what actually matters in Andromeda, and figuring out in what order to complete it, reminded me of the helpless dread that comes with tackling an inbox full of email. Even when the contents are kickass, wading through it and prioritizing is so mentally taxing that it saps the joy of what comes next. Proper pacing and maintaining a sharp sense of purpose is impossible when the player has trouble figuring out where to even start, or how to progress beyond main story missions. As the game is supposed to be about building a new home, I prioritized colonization missions. My assumption was that the inevitable crisis down the line would be determined by my preparation, and that humanity’s survival in this new galaxy depended on how “viable” I made planets. Helpfully, the game even gives you a specific percentage tracking this viability stat across locales, all of which contribute to an overall “AVP” number and level. Before you can set up an outpost, you have to rank up viability to a certain percentage by dealing with whatever pressing issues plague a planet: one area, for example, might be drowning in scavengers that you must clear out before you can live there. Terraforming harsh planets into liveable ones requires going to monoliths left behind by a mysterious civilization called the “Remnant.” To find them, you must strap into the Nomad, Andromeda’s hardy new vehicle. You will spend a lot of time traveling across vast distances on the Nomad: while there aren’t many planets to land on in Andromeda, the ones you can land on are enormous. I spent way too long having fun trying to climb extreme mountain ranges, though some of that exploration was hampered by stuttering and texture pop-in. Even when fighting against stock enemies, every encounter feels gratifying. Ryder can dash with the press of a button, which is useful both for avoiding enemy attacks, and darting around the field. Combined with my charging ability, I could come face-to-face with enemies within a split second, where I’d melee and shotgun them into oblivion. Charging also regenerates my shield, so I played more aggressively as I became critically damaged, rather than hiding behind cover. Ryder can vault up in the air and hover while shooting, allowing you to maneuver around enemy cover with ease. The cover system itself is finicky, given that Ryder sticks to it automatically (or not! ), but my build specifically rewards navigating around it, so it was never a big deal. Other playstyles may not have the same experience. While it’s possible to combo attacks together for massive damage, you can no longer pause to tell your companions to do specific moves, eliminating some of the tactical rigor that defined older games. In its stead, Andromeda asks you to think on your feet, to use your reflexes. It’s a thrilling change that turns Mass Effect into a fast-paced shooter, though it’s not devoid of of strategic elements. Andromeda allows you to craft three types of weapons, all of which can be modified on a more granular level. I ran around with a Remnant assault rifle that didn’t use ammo, but instead overheated after too much use, as well as a Plasma shotgun that fired off floaty yet potent bullets. Both had been fitted special barrels, stocks, scopes, and so on, all so that these weapons could complement my in-game techniques. Of all the things in the game, I marveled most at what Bioware accomplished with this game’s big cast of characters. You can take allies with you on missions, where they provide additional firepower and have plenty of banter, but that’s not what impressed me. Andromeda’s characters shine brightest during downtime, away from the action. As you progress through quests, characters constantly remark on where they’re at and how they feel, even if not tied to major story missions. The ship has a public message board, where people write to each other and make plans without you. As you walk around on your ship, you can hear conversations playing out all around you. People riff on who must have left the food out. They bicker about ugly unclaimed sweaters left in the laundry. They decide to make a religious study group. It took me a while to warm up to the characters, but that’s partially baggage. 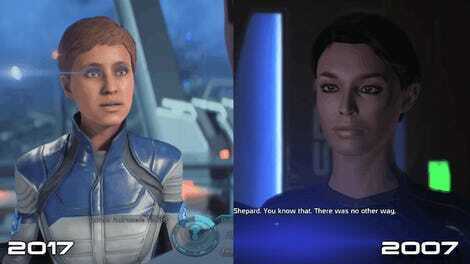 The core trilogy had three games to define its kickass characters, whereas everyone is starting from scratch in Andromeda.The comparisons don’t quite feel fair. They will happen anyway. I had a complicated dynamic with Cora, the second-in-command who, according to protocol, was supposed to get the Pathfinder title over a schmuck like me. She didn’t, and that made conversations kinda awkward—that’s not a feeling games explore very often. The Asari PeeBee, ever curious and impulsive, felt like a volatile personality next to the cool and collected Asari aliens I’d met in previous games. With Suvi, the ship’s scientific expert, I found myself exploring the role of spirituality in a society obsessed with science. My favorite new character has to be Jaal, the Angaran with surprisingly raw insecurities about his place in the world. At times, the core of Andromeda can seem hollow. I balked at the naivete and entitlement in thinking 100,000 people could just start a new life in a home that does not belong to them. I didn’t understand the Initiative’s belief that all of the races of the Milky Way could just sweep their complicated histories under a rug to start anew. It was as if Silicon Valley was trying to sell me on the idea that a hot new app would somehow stop world hunger. Something just didn’t add up here. These narratives are interrogated and become complicated, but only if you pursue the right quests. It took many, many hours, but eventually I found myself contending with Angaran anger over human colonization. And, without spoiling anything, collecting all the “memories” scattered across the world completely changed what I understood about the Initiative. Andromeda’s biggest flaw is in giving the player so much choice, that it’s incredibly easy to miss the crux of what makes the game good.